I hope you’re all having a wonderful week. 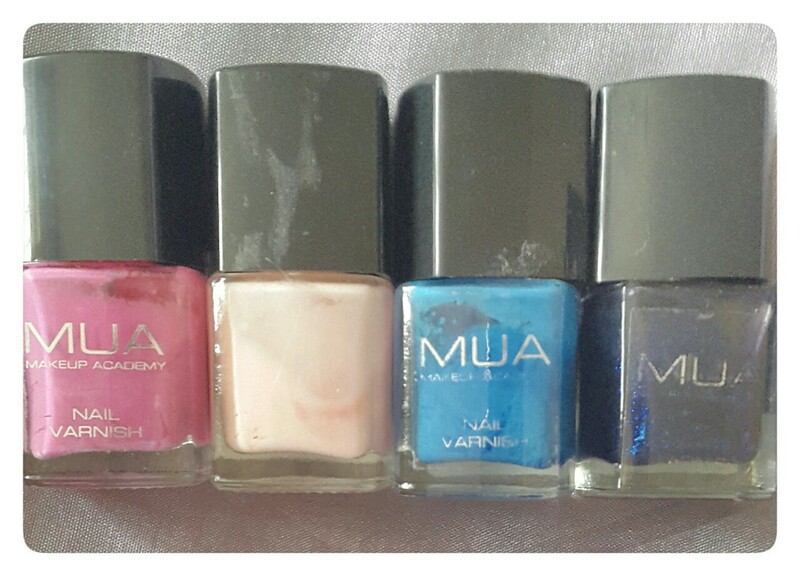 This is just going to be a really small mini review on th MUA Nail Varnishes. As many people know already I really like the MUA products (the eye shadows are awesome!) but I wasn’t too excited about the nail vanishes after trying them. I felt that the colour was pretty thin and came off really easy, so I looked like I had chipped nails the same day I’ve done them. The packaging isn’t great either, the labels wear off pretty easy and I haven’t actually done anything much with the polish to make the silver writing come off. It says ‘Maximum impact nails for an intense colour use two coats’ when I was putting four/five coats on before I felt like I was getting any colour. The brush head is of average size but for some reason it picks up too much polish, nothing major though. I really wouldn’t recommend these nail vanishes, even though they are only £1 from Superdrug. This make up review is pretty short as I don’t have much else to say about them about I think they were a little bit of a waste of money. Sorry MUA but I am not a fan!